Sometimes all you need is a little break. In a beautiful place. Alone. Have you always wondered if you can plan out a last minute budget trip for a weekend getaway? I definitely have, and usually it’s a friday such thoughts cross my mind. Ok, truth be told, I think about small escapes pretty much all day long especially after a long lazy lunch. But today is not about me. Luckily for you, if you are residing some place close to Delhi NCR, Alwar Weekend Trip is the perfect destination spot for you to explore. Here’s why. It’s practically in Delhi if you ask me. Just an hour drive from Neemrana, this lesser known destination has tons to offer + It’s a cost effective destination. Anybody travelling to Alwar has to visit Sariska National Reserve. If you are planning a weekend trip, your sunday morning is set exploring the grasslands. They have a 3-4 hour safari which I highly recommend. #3 The City Palace of Alwar is in some ways prettier than Amer ! No seriously. You have got to see the palace yourself to believe me. Currently in semi ruins, the palace luckily was not exposed to invaders because of its location. It’s one of the only reasons why most of the structure of the palace has remained intact even with little to no restorations. One of the biggest gems of Rajasthan is this vast manmade lake right in the middle of the desert. For a split second, you might think you have actually transported yourself to Santorini. The beautiful white walls and the stellar views from the top of the hill, its a must visit on your way back to the city. Don’t forget to sip some hot chai or coffee while you’re there. 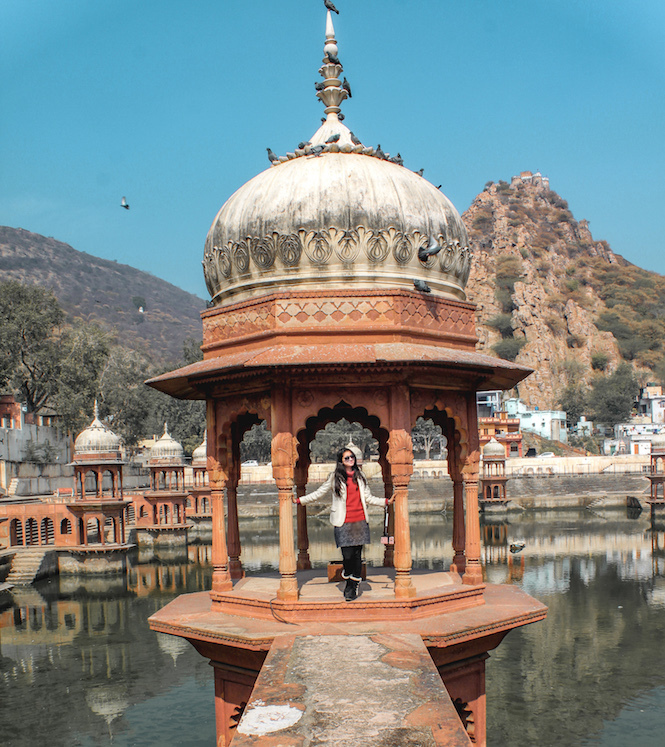 Ok, so now that we’ve established this is a gorgeous place to check out, here’s how you can plan an Alwar Weekend Trip on a budget. On a full tank of gas ~ INR 3000, you can do a to and fro from Alwar and back. May be you will be left with some fuel to drive another 50 or so kms. So if you have a car, this is quite a budget friendly trip to opt for. Budget Hotels in Alwar cost anywhere between 1200 to 3000 a night. We booked using GoIbibo and stayed right in the heart of the city. The hotel charges were 1200 a night and we got decent sized rooms, and basic amenities including a car park which was great ! If you are ok with spending more to get a better experience, you can try renting out a place on the outskirts of the Sariska Reserve. There are also a lot of budget stays in Alwar Airbnb which you can choose from. There are some local delicacies in sweets that you can try out in the local bazaar. But besides that, food really is not the key attraction in Alwar. I would recommend stick to your hotel or fast food chains to satisfy your appetite. Ideally all of Rajasthan shopping is concentrated in Jaipur, Jodhpur and maybe Udaipur to some extent. Alwar unfortuantely has nothing exceptional to offer to tourists in Rajsthani artifacts. The Sariska Safari is expensive. Like 1000 bucks or so per person. It’s highly recommended only if you visit it during better seasons of the year, like winter for instance. It does get hot really quick, so safaris usually start way before daybreak. The time when I visited Sariska during the peak of winters, we were out on the safari by 6:45 am. So go well prepared in advance and don’t miss the tickets because it does sell out pretty quick.